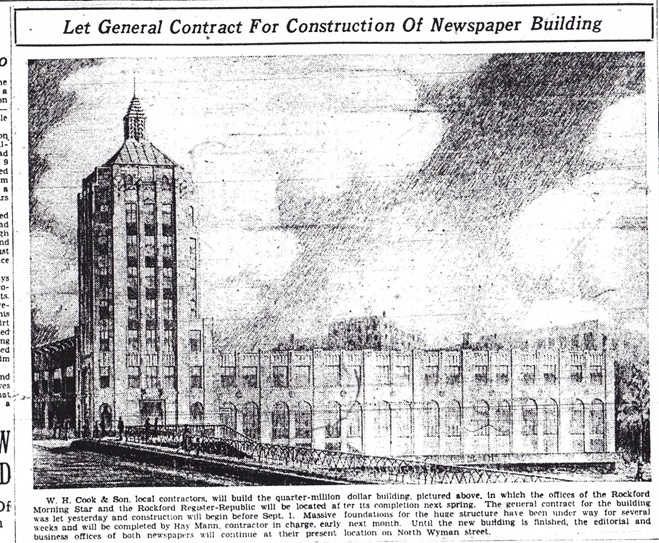 The original design and height of the news tower is shown in the top design, and the height of the lower, more horizontal section, which was in Rockford Daily Republic newspaper, Oct 1, 1929. Architect: Jesse A Barloga, Construction by Security Building Corp., Inc. Architect, Buildings, General, Newspapers	1929, 1931, Great Depression, Jesse A. Barloga, Register-Republic and Morning Star, Republic Building, Rockford Daily Republic, Rockford News Tower, Rockford Republic Building, Security Building Co.
Additional source: Jeff Aulik found this in the newspaper database and sent it to us. According to the 1930 – 1934 city directories, the building was vacant in 1930, and occupied by Jefferson Street Furniture Co. (retail furniture shop) in 1933, 1934….